The name "Himolla" is the combination of three words: Heavenly, Cozy and Pleasant. Learn how a small, German family enterprise developed into one of Europe's largest, premier furniture producers. Himolla has thrived using both innovation and tradition, over a period of many decades. Time sure flies when you're crafting beautiful, super long-lasting furniture- Himolla started manufacturing all the way back in 1948 (the photo is from the 1950's) and is now one of Europe’s largest upholstered furniture manufacturers, employing more than 3000 hard-working people. The Himolla factory currently encompasses more than 1 million square feet- Now that's plenty of room to produce some of the world's finest, back-healthy furniture! So where do all these great employees come from? Himolla incorporates a 2 year apprenticeship program for young people out of high school or college (comprised primarily of local and regional students). This program teaches many aspects of furniture design and production, and allows quality candidates an entry point to a career at the Himolla-Germany manufacturing facility. 1950 - 1952: First serial production begins at Himolla company at the heart of the city of Taufkirchen. 1958: The construction of the production plant and delivery center begins the first real stage of expansion. Over the next 10 years, the factory grows to reach its current size. 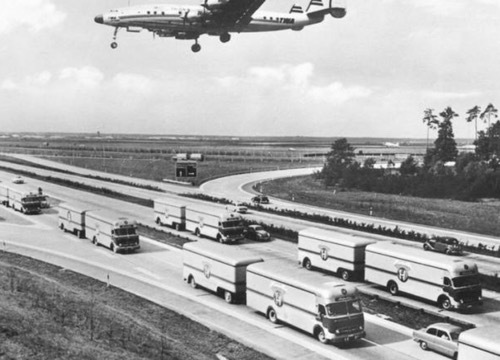 1960 - 1968: The rapid growth of the company leads to significant investment for the expansion of the factory and truck fleet and the introduction of new and innovative manufacturing technologies. 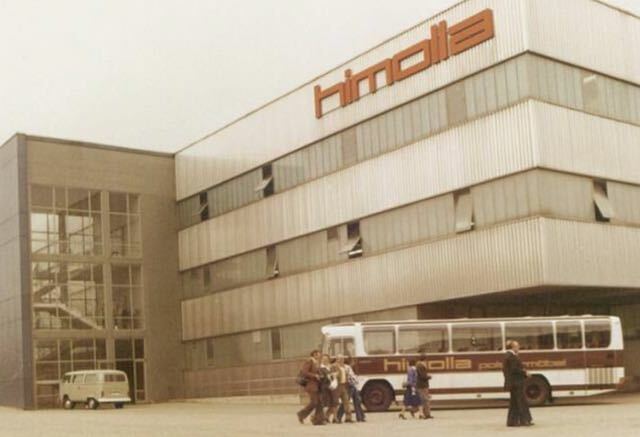 1972 - 1994: Himolla Furniture became one of the leading European companies in the furniture sector. 2000: The Himolla company adheres to the Environmental Pact of Bavaria. 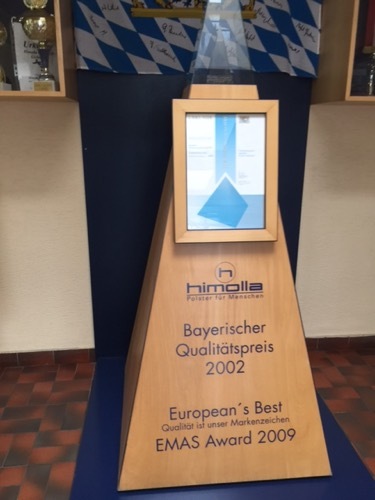 2002: Himolla Furniture received the "Bayerischer Qualitatpreis" in recognition of its production quality. 2009: Himolla wins EMAS AWARD 2009 in the category "Environmental protection in the supply chain and supply of products that are environmentally friendly." 2011: Himolla proudly obtained the important certification "Der Blaue Engel", which recognizes that the full range of products Himolla manufactures respects and protects the environment. 2015: Following a few years of planning and logistical preparation, Himolla launches into the North American market with a strong showing at the High Point Furniture Market in North Carolina. Today: The U.S. market continues to expand and embrace the amazing German quality and built-in comfort and back-healthy features that have made Himolla one of Europe's most-loved furniture brands. Each and every day, the state of the art Himolla factory inspires the dreams of 1000's of people! Their hard work certainly shows in each and every furniture piece they manufacture. "Quality made in Germany" is not just an empty phrase for Himolla, it's a company philosophy that is diligently followed every day of every year. The top-quality upholstered furniture is created in an advanced 969,000 square foot production studio at Taufkirchen. The machining facility uses the latest CNC technology and the combined skills and craftsmanship of the 3000+ workforce guarantee the high standard of Himolla quality. In addition, Himolla products are only sold through reputable furniture retailers that comply with stringent Himolla standards of product knowledge, quality and service. To ensure that optimum service levels and complete customer satisfaction are maintained at all times, Himolla gives retail trade partners full and extensive support. Himolla- "Function and aesthetics" should blend together in perfect harmony. Comfort, safety, usability, practicality. Himolla ergonomic designs are created entirely for your relaxation and well-being. The established design philosophy of "form follows function" has never been more true than it is today. At Himolla, function is the foundation on which everything else is based. Their technicians work to produce highly functional designs that reflect, as closely as possible, the wide range of aspirations of their individual customers. Working hand-in-hand with this functionality is contemporary design. It is an essential element in the Himolla philosophy since as well as sitting comfortably, customers also want to sit in style. So Himolla upholstered furniture is versatile enough to adapt to different physiques as well as being extremely pleasing to the eye. Since choice is also vital, customers can choose from an extensive range of models, in leather and fabrics to create their own individual furnishing statements, ensuring that Himolla furniture fits perfectly into their lifestyle and home. When you are creating products to function on a human level, there is no substitution for hands-on craftsmanship. Choosing the right covering materials is extremely important to guaranteeing ergonomic and comfortable seating, as well as insuring that the aesthetics are pleasing to the eye. Himolla's careful selection of the world's highest-grade materials, using their own in-house test lab and following stringent controls all converge to provide the uncompromising quality in all Himolla furniture products. Himolla upholstered furniture complies with DIN and RAL quality directives as well as the test criteria of the "German Association of Quality Furniture." From as far back as 1999, Himolla has been specifically certified EMAS and DIN EN ISO14001. This means that Himolla recliners and furniture are constructed to provide years of pleasure and enjoyment- Guaranteed. The first five years after your furniture purchase are covered by the comforting Himolla 5-year Guarantee on the frame and non-moving components. The upholstery, sub-springing and sprung interior are also covered by this rock-solid guarantee. To top-it-off, rest-easy knowing that your Himolla furniture can be shipped quickly from in-stock U.S. inventory (depending on model, configuration and covering), or actually made-to-order from the Himolla factory in Germany, specifically for you and your family. Himolla Furniture Functionality- Perfect Relaxation. Everyone is different. Each piece of Himolla's furniture is different too. Adjusted to your body size and individual expectations, every piece offers unbelievable potential for pure relaxation. A wide variety of models, selection of functions, the choice of electric-powered or manual adjustment, a great selection of leathers and fabrics, and a wide spectrum of colors, all designed to make each piece fit around you and your home perfectly. Different Sizes to Fit You Perfectly- Many models are developed in a variety of different sizes. This originates from the philosophy that everyone has their own, surprisingly unique shape. Adjustable Footrest- Integrated into the seat, the recliner footstools adapt to the desired position. Adjustable Headrest- Handy headrest tilt-action puts your head in the perfectly comfortable position. Adjustable Recline- The back tilts to achieve an extremely comfortable laid-back position in one flowing, continuous motion. Height-Adjustable- Having trouble finding a recliner that is the right height? Many Himolla chairs can be raised or lowered using easily-accessible levers on the side of the seats. Functional Lift-chair features- Our European customers can also choose the Himolla Lift and Rise technology that allows the recliner chair to raise you up and out of the seat. Talk about the best of both worlds- This insures that your recliner will remain a valuable, comforting part of your life, even when you reach those relaxing golden years. Chair Base Options- Base choices vary and the available options depend on which specific model you choose. These style options include covered round, star base and wood. They also include a variety of wood stain color finishes to fit any room decor perfectly. Manual or Electric Powered Recline Adjustment- The Himolla reclining mechanism on chairs and sofas can be operated manually (by lever or pull-strap), electrically (by remote control) or with side-installed sensors. Plug-in Storage Battery- Super convenient battery option on many models plugs into the seat back and charges with a convenient charging station. To charge the battery, simply pull the battery from behind the seat and plug it into the charging station. No dangling wires to trip over or to distract from the beauty of the chair. Super-smooth Revolving Base- Armchairs swivel completely around (360 degrees) making entry and exit from the chair a breeze. Superlastic Support for Personalized Comfort- In many parts of the world, the Superlastic seat support is available in multiple firmness options. These include: Soft for sitting in the optimal relaxation, Medium for a slightly firmer sitting feel, and Plus for a particularly firm and upright posture with tight interior. Cold Cured Memory foam- Common for those seeking the ultimate in support, cold cured foam contains strategically placed air pockets throughout the cushion to provide excellent long-term comfort and long-lasting support. Convenient Built-in Drink Holders- Certain sofa and love-seat models contain two hidden compartments that include drink holders to stow the days drinks and coffee. Integrated Phone Charger- Allows you to charge those electronic devices (iPad, iPhone, Android etc) from a built-in charging port. Say goodbye to all those straggling cables thrown around your living room. Bluetooth and USB Sound system- A few models (not available in all countries) have innovative Bluetooth and USB speaker systems that allow you to stream music directly from the chair. Plethora of Leather and Fabrics- Recliners and sofas are available in a very large selection of different grades and colors to allow the maximum choice for your living area. For the maximum in quality control, Himolla sources leather only from the best European producers. Fabrics and leathers are constantly exposed to thorough testing to guarantee the highest level of quality. This fine craftsmanship is guaranteed for years.